Specializing in pure wildflower and clover honey that can’t BEE beat! Managing 1200 colonies in the south Bruce! The Anderson’s beekeeping operation is one of the “top 10” largest in Ontario, with hives on 50 area farms. They are distributed from Lucknow to Southampton, Port Elgin, Bruce Township, Kincardine and Kincardine Township, Hanover and Holland Centre. 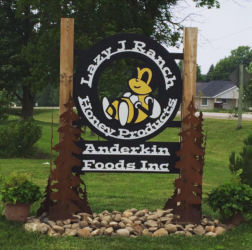 90% of Anderson’s honey is clover and alfalfa due to the strong field crop presence in the area, although yellow clover, spring and wild flower, canola, apple blossom and buckwheat are available in limited amounts.